Batman the Animated Series is one of the finest pieces of animation ever created as well as one of the greatest works of Television ever made. 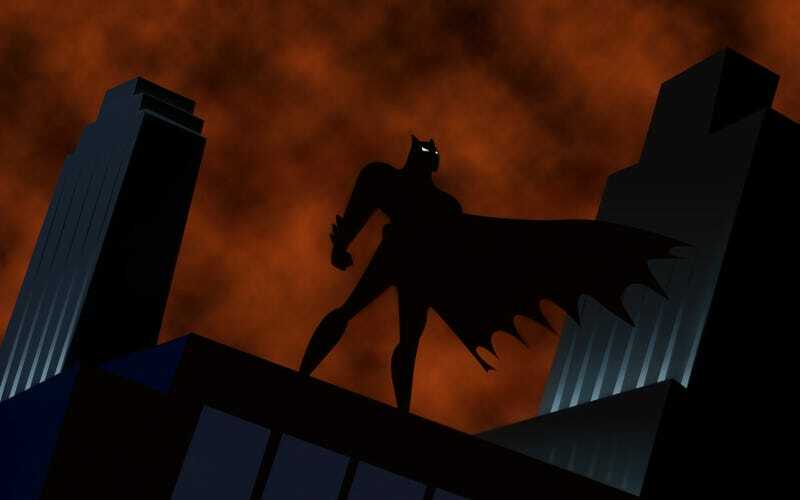 It created characters like Harley Quinn and Renee Montoya, defined Batman to many young viewers and without the series, it is very unlikely series like Young Justice or Gargoyles would have ever have been made. This isn't to say the series is flawless, that's impossible for any show. As such, here are 10 flaws from the otherwise perfect series. Please bear in mind that many of these are personal preference on my part and feel free to disagree. One of the problems with trying to animate Batman is making sure that he doesn't accidentally become invisible due to shadows or simply just because he is standing next to a black background. To work around this, the original artists came up with having the underside of his cape be blue. I can understand why they did that, but my problem is that I always felt, even as a kid that it was too light of a blue and seemed very unlikely that he would use such a bright colour. It is a similar problem that I have with how artists drew Batman in the 70s. Though at least with the Animated Batsuit, the bright blue isn't 60% of his costume. It would have made more sense for him to have worn a darker blue in my mind (or simply a dark blue costume like he does in the comics as that would have been a better choice for night-time stealth). 9. The Mad Hatter "New Look"
Another one of the redesigns will appear later but this one is more personal opinion. I've never been a fan of the new look version of the Mad Hatter. Given the characters backstory in the DCAU, it seems odd he was given grey hair and elf ears. He just seems way too goofy for me and unfortunately, unlike the other on this list, this never got redesigned. 8. Where did Firefly get his Wonderful Toys? In DCAU universe, Firefly is Garfield Lynns, a special effects wizard that becomes obsessed with old love and singer Cassidy. After getting laid off her team after assaulting her and then trying to burn her alive, he becomes Firefly... Somehow. Remember, in the time frame of his debut episode, Torch Song, he somehow creates the firefly suit, flamethrowers and a jet-pack capable of perfect flight in under 12-18 hours. This despite the fact that we are not ever indicated that he is capable of this type of technical prowess. One could argue with the flamethrowers as he was in charge of pyrotechnics, but the flamethrowers don't look like something you could make in that little amount of time and being chased down by the law. If he does have this unspoken of ability then damn! With that he can give Batman a run for his money. This may just be the Batgirl fanboy in me speaking, but I was really disappointed of how little Batgirl we see in the first two season. More disappointing when she was given a lot of build up as Barbara in the two parter Heart of Steel and I Am The Night. Besides her debut in Shadow of the Bat, she makes only one more appearance in Batgirl Returns. Of course, this is rectified when the show became the New Batman Adventures where she became a regular. It is just sad we didn't get to see more of her in the old art style. One of the odder choices the creators decided to do when working on The New Batman Adventures is to get rid of Batman's Bruce Wayne voice. In the first two seasons, Batman would use a lighter version of his real voice so he would bring less suspicion. However, it was removed in the latter run and in the two Justice League series which makes very little sense. Why would he drop it in universe? Won't people get curious that his voice completely changed in two years and that he sounds like a well known vigilante? 5. Why are Goons Following Mr. Freeze in Heart Of Ice? Heart of Ice is considered by many as the best episode of the entire run (personally I thought the two parter Two-Face was better but that's just my opinion). There is however one questionable part of the episode. Why are his goons following him? What is it that they're getting out of all this? Mr. Freeze doesn't care about money and cares only about revenge. Additionally, If Freeze's plan had went down without a hitch, the only thing they would receive is quickly getting arrested by the cops after Freeze kills Ferris Boyle. 4. The Jokers Original "New Look"
This is something that seems even the creators of the show seem to agree with. The new look version of the Joker is really odd and has nothing of what made the original version look menacing. It lacks the yellow eyes (or eyes in general), the red lips or the crooked nose. Thankfully, the Joker was redesigned again for The Return of the Joker which brought back with much of what was lost. Often given the title of worst episode of the series, it's pretty obvious why this episode was disliked. It feels like it is trying to pander to children way to much (something the series was well known for not doing) and feels more like a show that would have been made during the mid 80s. Luckily, this was simply a bad egg for many and the series never made a stinker of that magnitude again. Part of this comes from the shows producers feeling he was a gimmick character, hence why he appeared so little. To me, this is incredibly stupid because you can say the same of over 85% of all the Batman rogue's gallery. From The Penguin, Scarecrow, Poison Ivy, Mr. Freeze, The Mad Hatter, Lock-up, Baby Doll and even the Joker. That just sounds like laziness from the producers. But excluding that, his designs were rather lame in both the original and the new look. He never felt as powerful as he did in Knightfall and his reasoning for wanting to beat Batman were weak. This is one of the oddest things about the series. For the most part, the series is really good with its continuity, being able to use the opportunities to build on them such as with Mr Freeze and Deep Freeze, Man-Bat with Terror in the Sky and Catwoman's overall development. However, with some of the characters, they seem to de-evolve over the course of the series which seems like a waste of an opportunity. Harley Quinn is a great example of this. When she first appeared in The Joker's Favor, Harley was fully entrenched with the Joker, fully seeing him as her personal hero and lover. However, starting with Harley and Ivy, Harley begins to grow as a character and slowly realizes what the Joker truly is, fully giving him up in Harlequinade. After that, Harely tried to rebuild her life and is shown to actively try to do good in Harley's Holiday and Lock-Up. But suddenly, in The New Batman Adventures, all that character development is wiped. Though there is technically an explanation in Mad Love, it is really disappointing to see all that development wasted. Given her development, It would have been cool if she decides to use her street smarts, her knowledge of criminals, her obvious want for redemption and respect for Batman in Harley's Holiday become a Superhero of her own right and try to help her old friends gain redemption themselves. Wouldn't it have been awesome? Hell, they could have even had her join the extended Justice League or fight side by side with Batgirl. But sadly no. In the New Batman Adventures, she becomes incredibly inconsistent, switching allegiances episode to episode from Joker to Poison Ivy.